The original sense of the word "coach" is that of a horse-drawn carriage, deriving ultimately from the Hungarian city of Kocs where such vehicles were first made. Students at the University of Oxford in the early nineteenth-century used the slang word to refer to a private tutor who would drive a less able student through his examinations just like horse driving. 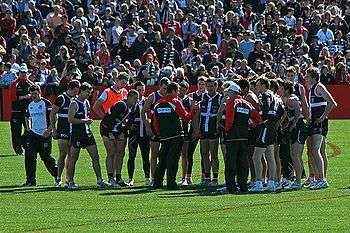 A coach, particularly in a professional league, is usually supported by one or more assistant coaches and specialist support staff. The staff may include coordinators, strength and fitness specialists, and trainers. In elite sport, the role of nutritionists, biomechanists and physiotherapists will all become critical to the overall long-term success of a coach and athlete. 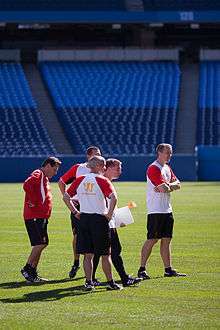 The coaching team of the Liverpool Football Club monitoring players during a training session. In association football, the duties of a coach can vary depending on the level they are coaching at and the country they are coaching in, amongst others. In youth football, the primary objective of a coach is to aid players in the development of their technical skills, with emphasis on the enjoyment and fair play of the game rather than physical or tactical development. In recent decades, efforts have been made by governing bodies in various countries to overhaul their coaching structures at youth level with the aim of encouraging coaches to put player development and enjoyment ahead of winning matches. Baseball, at least at the professional level in North America, is unique in that the individual who heads the coaching staff does not use the title of "head coach", but is instead called the field manager. Baseball "coaches" at that level are members of the coaching staff under the overall supervision of the manager, with each coach having a specialized role. The baseball field manager is essentially equivalent to head coaches in other American professional sports leagues; player transactions are handled by the general manager. The term "manager" used without qualification almost always refers to the field manager, while the general manager is often called the GM. More than 30 sports now have their coach education programmes endorsed as meeting the standards of the UK Coaching Certificate (UKCC) as an indication of quality assurance. Typically, such programmes classify coaches within Levels 1-4, with Level 2 being the minimum standard for someone to coach unaccompanied. Coach education programmes are usually organised centrally by the NGBs but delivered locally to meet the needs of volunteer coaches. For anyone wanting to become a coach in a particular sport, the NGB website provides the first point of contact for further information. The UK Government, through DCMS, highlighted the need for detailed research into sports coaching patterns. As a result, major tracking studies have been completed. These confirm that three in every four coaches is a volunteer, typically giving up three hours a week to coach their sport. Fewer than 5% of coaches in the UK are full-time professionals, in stark contrast to the USA. Successful coaches often become as well or even better-known than the athletes they coach, and in recent years have come to command high salaries and have agents of their own to negotiate their contracts with the teams. Often the head coach of a well-known team has his or her own radio and television programs and becomes the primary "face" associated with the team. Both the collegiate and professional level coaches may have contracts for millions of dollars a year. The head coach at the pro level has more time to devote to tactics and playbooks, which are combed over by staff that are usually paid more than at the college level. The pro level head coaching, due to the extensive time on the road and long hours, is a very stressful job. Since the money is good at high levels, many coaches retire in their early fifties. Also, professional staffs are not limited in the number of assistants which can be hired, NCAA Division I FBS teams are limited to nine full-time assistant coaches. Many factors are part of NFL coaches' contracts. These involve the NFL's $11 Billion as the highest revenue sport, topping the Major League Baseball's (MLB) $7 Billion, while holding a non-taxpaying exemption that the MLB does not. The unusual distinction of being a tax exempt multibillion-dollar corporation and a tax exempt monopoly that can move teams from one city to another, is combined with Stadiums built through tax-free borrowing by the Cities, which every American taxpayer pays for in public subsidies. The NFL's coaches are the highest paid professional coaches with professional football topping the list in Forbes' highest-paid sports coaches. Bill Belichick is in the #1 spot for the second year in a row with no MLB or National Hockey League coaches making the list. Coaches also often create game plans, or instructions for what their players will do during the game. For every sport, there are different game plans. For example, in association football, the coach may choose to have a goalkeeper, four defenders, four midfielders, and two forwards. However, a coach may also choose to have a goalkeeper, four defenders, three midfielders, and three forwards. It is up to the coaches to decide how many players will play a certain position at a time, as long as they do not surpass the maximum amount of players allowed on the playing field at one time. It is also up to the coaches to decide where and when a certain player is going to play. ↑ "Manager or Coach?". Football Italia. 2008-09-05. Retrieved 2011-01-30. ↑ "Coaches". Retrieved 30 November 2013. ↑ "NPQ – Nonprofit Quarterly - Promoting an active and engaged democracy". Nonprofitquarterly.org. 2008-08-14. Retrieved 2012-10-03. ↑ "In Stadium Building Spree, U.S. Taxpayers Lose $4 Billion". Businessweek. Retrieved 2012-10-03. ↑ Marthaler, Jon (May 10, 2013). "In soccer, the game plan isn't quite the same". Retrieved 30 November 2013.